I don't understand how they can have the Knowledge graph on UK Nexus 7's via Google Now and test extending the Knowledge Graph in the US but not release the original web Knowledge graph outside the US? I live in India and I can see the knowledge graph in my search results. It looks too messy - too many snippet cards (in head, right-side, in middle). i agree with Binyamin. it looks a bit messy. better use lines to separate different divisions. Messy messy messy - what happened to the nice clean look for Google? I agree its too much mixed up. Does Google know about this? How does Google determine which sources get picked? Your question is vague, so maybe it would be helpful to provide the query that returns poor results. 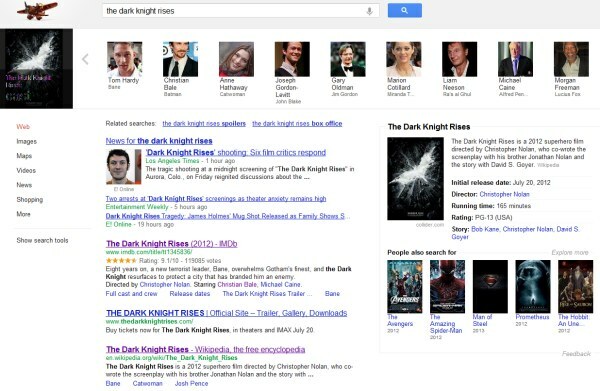 Knowledge Graph extracts data from websites and learns from the web. I don't think there's a list of sources, although sites like Wikipedia or CIA World Factbook are trusted a lot more than a random blog. "Google's Knowledge Graph isn't just rooted in public sources such as Freebase, Wikipedia and the CIA World Factbook. It's also augmented at a much larger scale—because we're focused on comprehensive breadth and depth. It currently contains more than 500 million objects, as well as more than 3.5 billion facts about and relationships between these different objects. And it's tuned based on what people search for, and what we find out on the web."